The photos taken in wartime and the written testimonies coming in postwar period are responsible for shaping our imagery. Videos are not so important in the reconstruction of the First World War, for sure their importance is not comparable with the one they have today (think about the Gulf War, probably the first “television war”). The question is always the same: what do we really know about the wars and the Great War in particular? How to behave in front of the propagation of false news and propaganda in wartime (Marc Bloch). Sometimes it seems we are living between the arrogance and the self-confidence coming from historical researches. If we read Robert Darnton's books we are probably absorbed in the same kind of questions: the diversity of times and spaces is probably transforming every historiography into a heap of unconvincing and highly debatable knowledge. What can we know about the battles if we did not take part to them? How can we keep a balance between a full skepticism and the above mentioned self-confidence of historical knowledge? In Témoins by Jean Norton Cru we see a first methodical, probably too grandiose attempt of cataloguing all kinds of testimonies belonging to World War I years. Jean Norton Cru wrote in his books about the concept of "First World War battle" as an "abstraction" and his approach was not ascribable to historical revisionism or negationism (even if someone tried to use him as a forerunner) and for sure he was not aiming of being lynched. It's like to say that it is impossible to bring the past and its complexity back to life. And it's about Norton Cru's books that we would like to spend some words, because they are probably preparatory (or at least “functional”) to all possible discussions about the value of historiography and testimony of the Great War years. 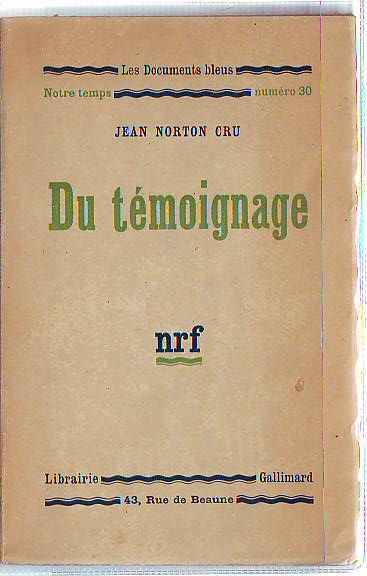 Jean Norton Cru wrote at the end of the Twenties two books about his researches (he was a poilu of the western front and took part to the battle of Verdun, so he probably had an idea of what a "battle" is). Témoins (now in the catalogue of Presses universitaires de Nancy, 1993; the complete title was Témoins : essai d’analyse et de critique des souvenirs de combattants édités en français de 1915 à 1928) first came out for Ed. Les Etincelles in 1929, the year of Hemingway's Farewell to Arms and Remarque's Im Westen nichts Neues, and it's a collection of 251 testimonies of "combatants" of the Great War (one of his goal is to reshape the meaning of the word "combatant"). Du Témoignage can be considered as a shorter version and a compendium of Témoins. The books were able to rise at that time a big debate around them (also because of the political tendencies of their publishing house). Why? Cru was probably the first to apply a kind of etnomethodologic approach to World War One testimonies. His overlook is from the bottom to the top and he became protagonist of one of the fiercest attack to military history appeared during the Twenties. His first book was probably a natural reaction to all the huge fabrication of "lies" he red in the aftermath. One of his main concerns was to understand deeply the level of reliability of each kind of testimony and to separate the good ones from the bad (his good will may seem too optimistic today). It's like saying he was concerned about their "level of truth" of all possible testimonies. In these terms we could even consider his works as epistemology. It was also a “cause célèbre” his polemic with Henri Barbusse and his most popular book, Le Feu, accused of being far from the reality of the war. His books are not the most important key to approach the World War I but they are relevant, also for the general evaluation of all kinds of writings (diaries, testimonies, memoirs, novels, letters). Every time we speak about World War One we should go back to the value of testimonies and memoirs asking frequently to ourselves what do we really know about those events. Even reading Marc Bloch's Memoirs of War (for World War I) or The Strange Defeat (for World War II) the feeling is the same and at the end of the day the only certainty is the need of this Socratic prudence that does not mean pure distrust and skepticism. We’re not putting on the same level Norton Cru and Bloch. The first was probably suffering from “extreme positivism” due to his education. The crucial point rising after reading both of them is "how to narrate history?". We often run the risk of skimming over a bookish knowledge of historical facts. If with Marc Bloch we are for sure at the highest level of 20th century's historiography, the importance of Norton Cru’s works lays perhaps more on a pure documentary and bibliographic basis, and his pacifism did not allow him to understand the war experience of his “combatants”. Cru was too concerned in understanding the “level of precision” of the writings he examined. But his approach can be considered still today a warning against all kinds of falsification risen in the postwar period (and, strange to believe, we still live in the postwar period, with lots of documents still to sift).